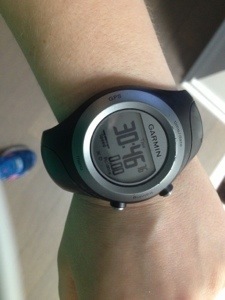 Yesterday morning, I elected to do an easy workout to see if it would help clear out my system from the snifles I have. I did 30 minutes on the elliptical. It did make me feel better afterwords, although I feel like death today. It was a bright and clear morning. I love my commute. 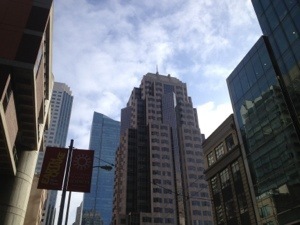 Five blocks through downtown SF. Are you sick of city shots? Too bad, because I’m not. I had lots and lots of green tea because it felt good on my throat. 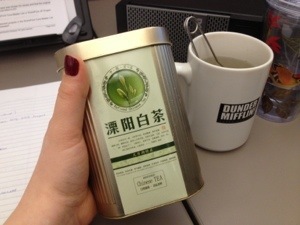 I got this tea from a work friend that brought it back from a visit to China. On the canister in English it says, “Tea is widely recognized as the most healthy and inexpensive daily beverage in people’s daily life.” I assume that’s true given you don’t have to buy a plane ticket to China to obtain tea. 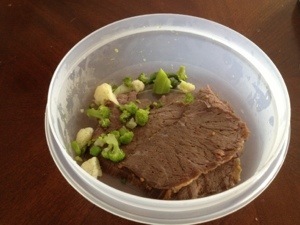 Lunch was leftover roast and some veggies that Squishy didn’t eat. 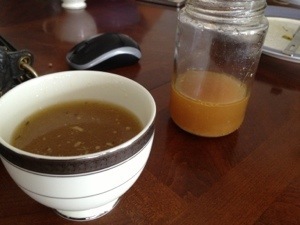 And some chicken broth that we made last week. Perfect sick food. Which brings me to my next topic, Whole30 goals. Now that I’m starting another Whole30 next week, I should probably, like, plan out some goals or something. My #1 Objective is to Kill All the Sugar Demons. You are all dead to me. As soon as I finish this bag of Swedish Fish. And then you are gone. That’s it. That’s all I’m looking for. I want my life to no longer revolve around sugar. On the other side of the fence, can wine go bad? Hulk opened a bottle of Vigonier last night, and it was horrible. It didn’t taste corked, but the nose was super sweet, like honey, and the taste was terribly flat and acidic. It was just bad. Not sure if it was just a crappy wine, or something went horribly wrong. Plus, the color was super brown for a white wine. Almost amber. Any wine affectinatos out there know what happened? I couldn’t finish my glass and we ended up dumping it. No wine for me last night. Le sigh. I only have a few more precious wine-drinking days before April. Definitely not sick of your City shots! As a rural city person without sky scrapers I love seeing them. Oh that horrid sugar demon! It’s out of control in my house….I even use fruit to feed him sometimes and it just makes it worst! 😦 had to tip your wine out…nooooo, there are only 3 wine drinking nights left.